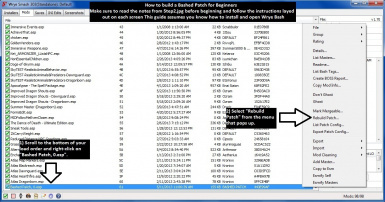 A beginners pictorial guide to creating a Bashed Patch using Wrye Bash. Feel free to link to this page on in your mod descriptions or include the tutorial with your mod releases, just give me a mention for credit is all I ask. The Wrye Bash Team for creating a great utility. The BOSS development team also for a great utility. Hello everyone. 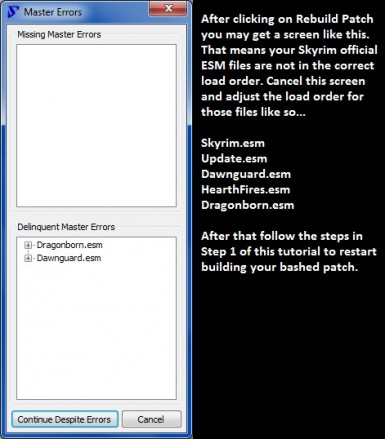 The intention of this pictorial guide is to assist newcomers to modding skyrim in creating Bashed Patches using the Wrye Bash tool for Skyrim. Being there are a bunch of great Weapon, Item and Creature mods out now, the best way to take true advantage of them is to create a Bashed Patch which merges leveled lists from all these mods together so everything can spawn randomly in harmony with one another. There are other guides online I know and while they are good, they can leave out some of the basic steps that a beginner would have troubles with. 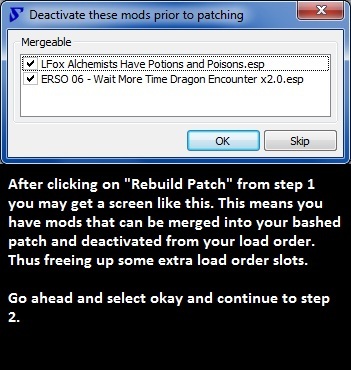 I made this guide to help even the most novice of users create a Bashed Patch quick and easy. I have not seen a guide created specifically for Skyrim yet, and being I made this guide to share with close friends. I figured I would upload it to share with everyone else. I hope this helps folks get their "feet wet" so to speak, feel free to comment and endorse as you wish. 2.0 - Fixed any remaining typos. 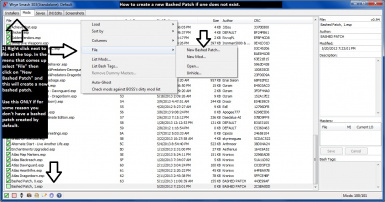 Added 2 new tutorials "How to create a bash patch file if one does not exist" and "How to manually add Bash Tags to your mods". 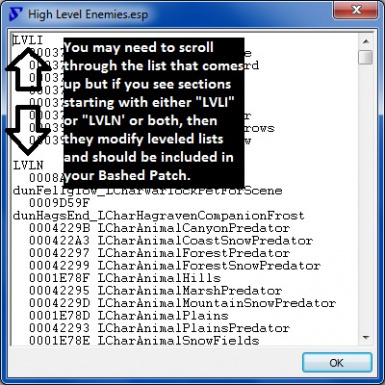 Updated "How to find out if your mod has leveled lists" Step 2 with some important information. 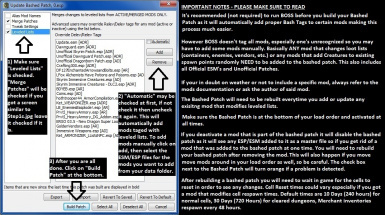 Updated some notes on Step 2 of the "Creating the Bashed Patch" tutorial. 1.1 - Fixed typo in Step 1a of guide. Added some info about re-arranging load orders to step 2. 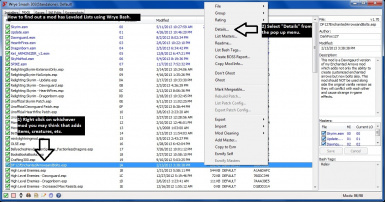 Added additional guide on how to find out if a mod has a leveled list or not using Wrye Bash. Updated main mod photos with new tutorial and updated steps. Some may not know what a Bashed Patch is exactly. You have to understand how leveled lists work in Skyrim (or any other Bethesda game). Basically each mod (and yes even official DLC's and the main game) that adds items, weapons, creatures, etc. randomly to the world space use what's called a "Leveled List" this sort of acts like a database where items are pulled when an container, NPC or enemy, etc. is spawned and the items are chosen based on how far along you are in the game. Now let's say you add several weapon mods that say add daggers to enemies at random and play the game. Now when it comes time to spawn said enemy one of two things will happen. Either one mod will spawn the daggers introduced in that mod only (usually whichever mod is lower in your load order) every time or a conflict may occur and crash your game. 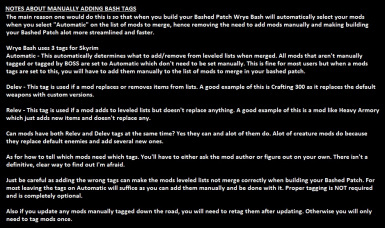 A Bashed Patch helps alleviate those issues by combining all the leveled lists together so items are distributed evenly and without conflict, thus making your game more varied and allows you to enjoy the items from all your mods rather than just from one mod all the time.